Entry by SubaruSumeragi on Sat May 21 07:32:25 2011.
i officially don't dislike her anymore. I still don't like you much, but this rocked! 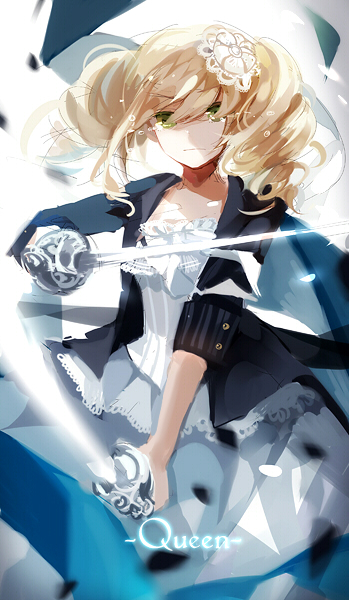 She's annoying.....yet she looks AWESOME with Rapiers! Lizzy kicks so much****that i must bow down to her!!! Shes like 10 and is awesomely talented with rapiers!!! Elizabeth is soooo damn cool in this part! i like her from the start because of her cute voice.. Isn't she a wonderful girl and character? It's such a amazing, beautiful artwork that I see here. btw she looks so cool when she fight using swords like that! ^ then why don't you blacklist the Elizabeth Ethel Cordelia Midford tag? its not that difficult. Namea I don't think she was the most hated character and honestly she wasn't that bad to begin with. setarehabi why should she die, what has she done to deserve death? Kyokyo<3 same with you, why should she die, is it because you think she's stupid, so stupid people should die? you are really making yourself look like a terrible person. @ZDragonX well sometimes I want an annoying character that I hate to die. but well it was when I just watched anime but she's not as annoying as anime in the manga. this brings back memories... I don't care about her anymore.